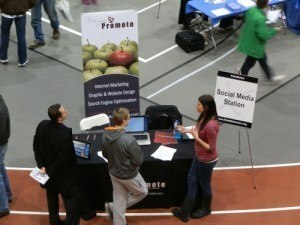 Once again, Design & Promote was present at the KidsMatter Student Job Fair held recently at North Central College on Wednesday, March 19th 2013. The fair provides young people one-stop access to scores of businesses in need of part-time help. With resumes in hand, they complete job applications, learn about opportunities, and even hone their communication skills in mock interviews. We have attended the fair the past two years in part to support KidsMatter, an excellent, worthwhile organization that hosts programs to empower kids to be all they can be. However, we also attend in the spirit of their mission to educate young job seekers about the role of social media in their job search efforts. While most young people today have at least one social media account, many don’t realize that their online profiles may make the difference between landing the interview or landing their resume in the discard pile. 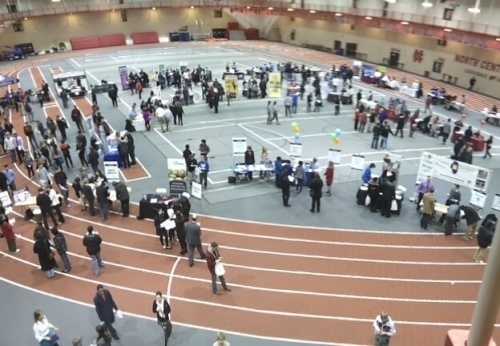 So each year we compile important statistics about how employers are using social media to evaluate applicants and we distribute them to the job fair attendees. What did we find this year? Social Media Can Win the Job. Comparing these statistics to last year’s, the biggest increases are in the first and last bullet points. The number of employers who found that the social media “profile provided a good feel for the candidate’s personality and fit” rose 8% from last year! But there was an even higher increase—16%–of employers who saw that “other people posted good references about the candidate.” The takeaway from all this—your profile is increasingly important to employers; and, if you can get a satisfied employer to post something positive about your work on your social networking site, it can boost your opportunities! Social Media Profiles Can Also Lose the Job. These statistics have not changed significantly since last year, and they remain as a warning to young job seekers: be mindful of the information you post online and how it looks to employers. The way an employer views it, once you are hired, you are a representative of their company. What you post online reflects on others as well as you! Keep it Private. Make sure your privacy settings are set to “friends only” so personal pictures are not visible to everyone who visits your site. Monitor Content. Delete comments and untag photos you wouldn’t want employers to see. Use a Professional Email Address. Who appears more professional: john.smith@gmail.com or hotstuff599@hotmail.com? Set up a professional, free gmail account for your job search. Follow Companies You’d Like to Work For. You can be one of the first to know about news and job openings at a particular firm. Create a Profile. Employers use LinkedIn to find qualified people. Create a profile and update regularly. Add Your Resume. Linkedin can import your resume for the convenience of employers. List Yourself in a Group Job Section. Join a LinkedIn group of interest and post an ad expressing your job availability to the members. Has your social media helped land you a job? Let us know how. And you can click here to receive more great tips from Design & Promote on how to effectively use social media in a job hunt.